In this edition of the Spotlight I want to discuss a ride local to me, Santiago Canyon. Riding through suburban south Orange County you'd never expect to find a back country haven like Santiago Canyon, until it's suddenly right in your face demanding acknowledgment. There are three main entrances to this ride, and one more via Saddleback mountain (for our dual sport readers). It really doesn't matter where you enter from though, as all of them will give you an incredible day. Click here to see the Irvine start point. Click here to see the Trabuco Canyon start point/halfway marker. This is a pretty short cruise but is packed with detours and sights. 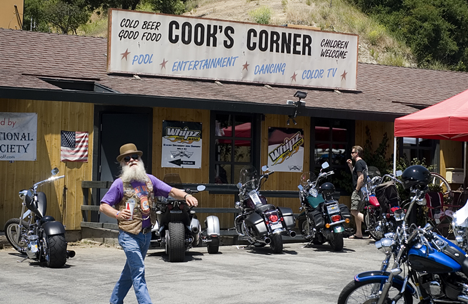 The legendary Cook's Corner marks the halfway point, or the start point if you enter from Trabuco Canyon. 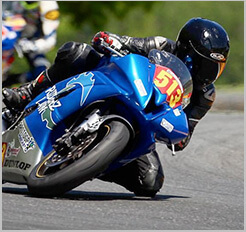 On the weekends Cook's Corner gets filled to the brim with motorcycles, everything from mild to wild. Come here during any business hour and you're guaranteed to make some new riding buddies if you want. Black Star Canyon is an incredible nature hike and scenic point within Santiago Canyon. To get here you'll turn off Santiago Canyon Rd onto Silverado Canyon Rd, then make a left at Black Star Canyon Rd. Here is where it's located on the map. If you ride down Black Star Canyon Rd, you'll eventually arrive at a gate, most likely with parked cars around. Leave your bike here and you have two options, continue inside for a stunning 6 miles nature walk (complete with waterfalls) or a lesser known and quicker indulgent is if you climb the very small hill/cliff to your right. On top you'll find it opens up into a green valley with some rustic old farming structures. During spring the grass grows waist high, and as you can imagine it creates for a truly incredible atmosphere. If you continue down Silverado Canyon Rd this will take you all the way to the peak of Saddleback Mountain. Keep in mind that from the foot of the mountain to the top is all dirt, so unless you're on a dual sport your ride will turn back here. If you continue on, this becomes Cleveland National Forest territory, and if you intend on parking and wandering about, you're supposed to have a pass. Now sometimes the gate to enter the trail(s) to the top is closed, so check this page and refer to the status of "Maple Springs Road". You can double check the status at the first fire station you pass, which has a sign out next to the road which reads something to the effect of "Gate: Open/Closed". Even if you aren't dirt capable I highly recommend you take a ride down Silverado Canyon Rd. You'll pass through a couple quaint little towns and lots of backcountry residential areas. The whole ride is very relaxing and if you're left wanting more then take the side road on the way out. Santiago Canyon is also home to other well-known points of interest such as Irvine Lake, Holy Jim Canyon, O'Neil Wilderness Park and the Tucker Wildlife Sanctuary. Right next to the Irvine entrance/exit is the Orange County Zoo and a couple miles from the Trabuco Canyon start point is the Whiting Ranch Wilderness Park. Enjoy the ride!